I admit! I am one online shopping addict. Well it’s not entirely my fault. Some pieces from online stores are just so irresistible. Just like the ones at Zalora Philippines. After browsing through Zalora, placing an order, and receiving my package. I decided to make a review to share with you guys. Time to find out what‘s inside these Zalora boxes. See these boxes?? Yes! I bought all of these from Zalora at once... Just kidding. The largest box was ordered last January, the box on the upper right was also from January but I ordered it days after, the smallest box has my recent order. First let me share a short info about the Zalora Online Shopping site. Zalora is an online fashion retailer that sells apparel, accessories, shoes and beauty products for women and men. Zalora headquartered in Singapore. In 2012, Zalora launched its various localized sites across Hong Kong, Indonesia, Malaysia, the Philippines, Singapore, Taiwan, Thailand and Vietnam. In Australia and New Zealand, Zalora also operates as The Iconic. So what’s inside those Zalora boxes? 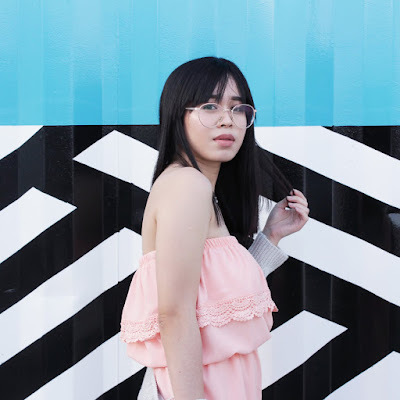 What’s in my Zalora haul? The box & black envelope from the photo above was from my latest order at Zalora. I'll be sharing the exact dates of when I ordered the item later on. Just this year, I fell in love with holograms. (I am obsessed!) I kept on searching online for different holographic pieces but they were quite expensive but one faithful day, while browsing Zalora’s shopping site... Lo and behold, I found a hologram shoe and even a bag. I just had to have it! Thank youu Zalora! Yehey.. I was able to get discounts! 20% off from using my Smart Money card plus a coupon! So happy! I was a little disappointed with my last order from Zalora though because it didn’t look as holographic as I expected it to be, another reason is with the holographic sneakers, they’re both dark colors but the sneakers have this holo look in them (you can see it in the photo) but the bag didn’t looked as holographic but nevertheless, it’s still beautiful. By the way, the pieces I bought are all from Something Borrowed (one of Zalora’s in-house brand) which is now definitely my go-to brand when shopping (or online window shopping) at Zalora from now on. This isn’t the first time I ordered from Zalora. The first item I bought was a lovely blue dress from EZRA (another Zalora brand). 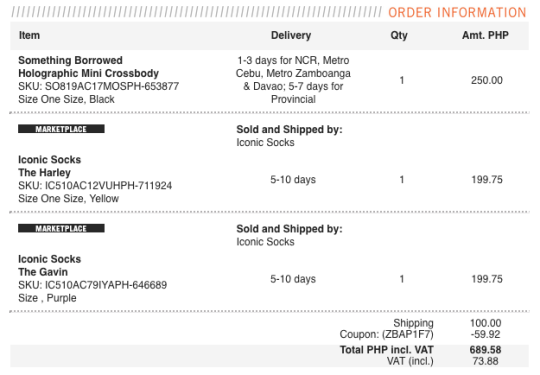 Another thing I like about Zalora is that they ship really fast. You could get your order the next day. I had an experience where Zalora sent a message that my parcel is already on the way but I actually got my order on hand already. Haha. 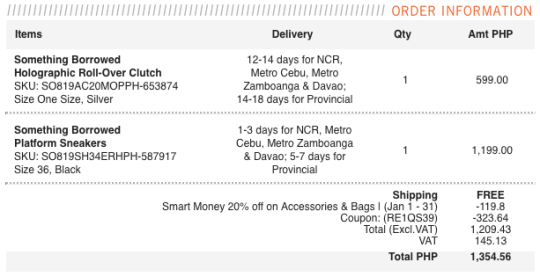 Feel free to share your shopping experience at Zalora :) Would love to see your loot.